Seattle Tool's 34" Elite Series Tool Cabinet is a professional roller tool cabinet built to maximize storage, strength, and durability. Heavy-duty and lockable double-walled cabinet features six ball-bearing slide drawers with a chest lid compartment. High density welds and reinforced drawers ensure heavy-duty structural integrity built to last. Hand-brushed aluminum drawer pulls are reinforced and feature rolled edges to prevent accidental cuts and scrapes. Constructed from premium cold rolled steel with scratch, grease and corrosion resistant powder coating. Four tough thermoplastic rubber wheels combine the durability and strength of a hard tread wheel with the noise reduction and floor protection of a soft tread wheel. This Super Heavy Duty 35 inch. 6-Drawers Roller Cabinet is BU.jpgilt to last with thicker steel and stronger design for rugged work environments that a Professional would experience. It's equipped with heavy duty ball bearing slides for smooth performance and is a great solution for your tool organisation needs. This cabinet moves around easily on four heavy duty 6 x 2 inch. casters and a side handle for comfort and easy manoeuvring. 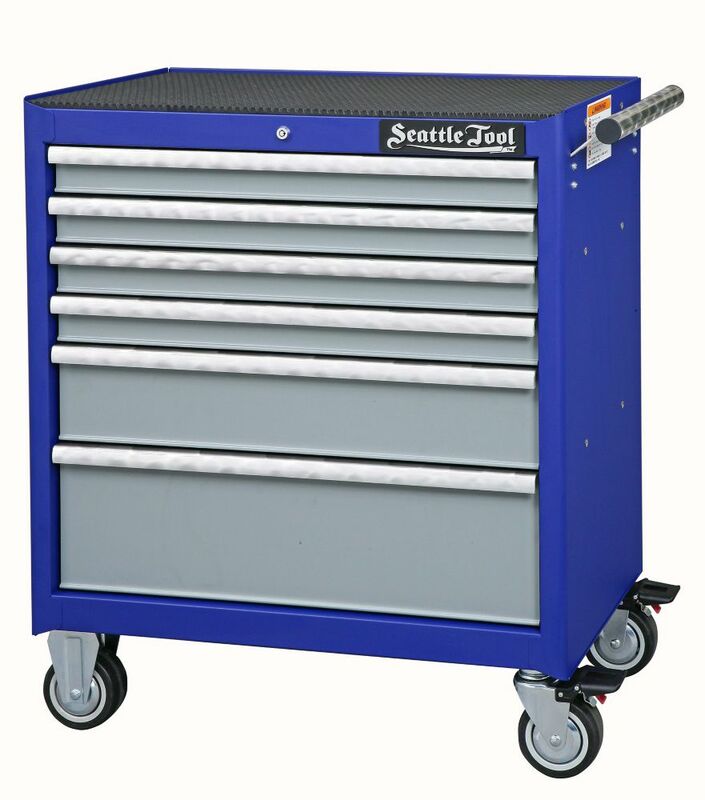 34 Inch Elite Series Tool Cabinet - 6 Drawers Seattle Tool's 34" Elite Series Tool Cabinet is a professional roller tool cabinet built to maximize storage, strength, and durability. Heavy-duty and lockable double-walled cabinet features six ball-bearing slide drawers with a chest lid compartment. High density welds and reinforced drawers ensure heavy-duty structural integrity built to last. Hand-brushed aluminum drawer pulls are reinforced and feature rolled edges to prevent accidental cuts and scrapes. Constructed from premium cold rolled steel with scratch, grease and corrosion resistant powder coating. Four tough thermoplastic rubber wheels combine the durability and strength of a hard tread wheel with the noise reduction and floor protection of a soft tread wheel.